Could the Giants value D.K. Metcalf’s size and athleticism for their receiving corps? The draft community was expecting big things from Ole Miss wide receiver D.K. Metcalf coming in to the 2019 NFL Scouting Combine. The fact that Metcalf was a bonafide physical freak was no secret among college football fans. He showed rare speed and explosive power on the football field, and was known as an athletic marvel since enrolling at Ole Miss. But things ramped up to another level after he practically broke twitter with a shirtless gym picture, and expectations for the Combine were through the roof. And even so, his workout took analysts by surprise and had former NFL scout and NFL Network analyst Daniel Jeremiah comparing him to a comic book character. Over the course of the offseason, the New York Giants reconstructed their receiving corps to feature undersized receivers who thrive in the short and intermediate areas of the field. However, they lack a distinct vertical threat to keep defenses from stacking the line of scrimmage. If he lasts long enough, could the Giants look to Metcalf in the middle of the first round to add another athletic freak to their offense? Elite blend of size, athleticism, and strength. Uses strength well to get a good release off of press coverage. Flashes the ability to vary running tempo to create separation. Shows dominating strength as a blocker. Did not run a diverse route tree. Lateral agility is a question. Needs technical refinement in his route running. Metcalf physical gifts are unquestioned, as few human beings have his combination of size, strength and athleticism. For this reason, he has a truly elite ceiling. In a lot of phases of the game, he takes advantage of his physical traits. Whether releasing against press coverage, separating using physicality or his contact balance as a route runner, Metcalf uses his physical tools on a play to play basis. While D.K. 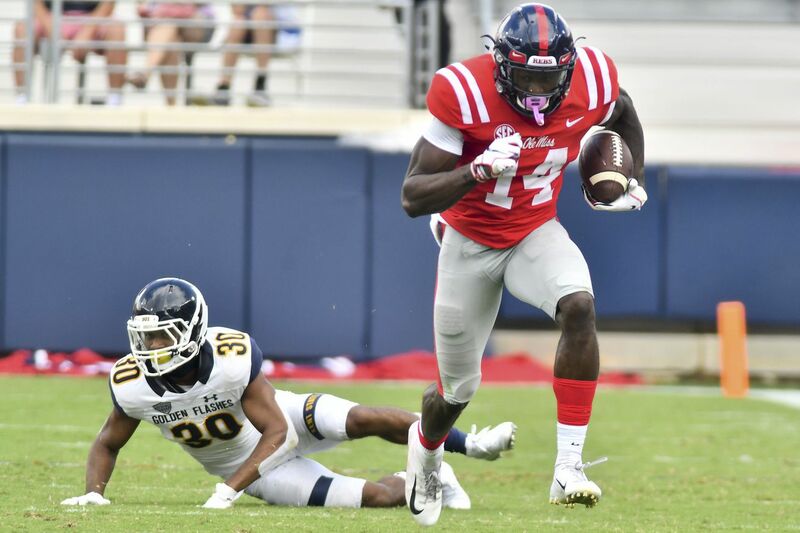 Metcalf will likely be the first receiver drafted this year, and will likely be the top receiver on many boards, he isn’t a slam-dunk “blue chip” player like the top players at some other positions. Whichever team drafts Metcalf will have to do so knowing that he still needs development to reach his full potential as a player, and that there will be some routes and concepts that simply do not play to his strengths. At his best, Metcalf’s size, speed, and explosive strength let him stretch the field and stress a defense vertically like few other receivers in this class can. And despite being an unpolished player, Metcalf is already a difficult receiver for corners to play in press-man coverage. He flashes quick hands at the line of scrimmage to prevent a firm jam, has the strength to run through early contact, and that long speed stresses any corner without great footwork and a smooth transition. That often forces defensive backs to respect his speed and allow a big cushion, which Metcalf can then exploit with surprising start/stop quickness. Other than polish in the technical aspects of his route running, the major concern with Metcalf is his hands. He does suffer from concentration drops, trying to make a play before he has caught the ball. So far the Giants have built their passing game solely to work the middle of the field in the short to intermediate range, and hope for yards after the catch to generate big plays. That is where both Sterling Shepard and Golden Tate have historically thrived, and they have shown a definite preference for using Evan Engram in that area, as well as forcing Saquon Barkley to make up more than 100 percent of his total yardage after the catch. If the Giants want to add a vertical element to their offense and either force defenses to defend the whole field or exploit them when they don’t, Metcalf has incredible potential and a relatively high floor with the right development and scheming. If the Giants aren’t worried about having a vertical element in their offense and want to add a receiver who is a more detailed route runner and polished technician, they should look elsewhere.